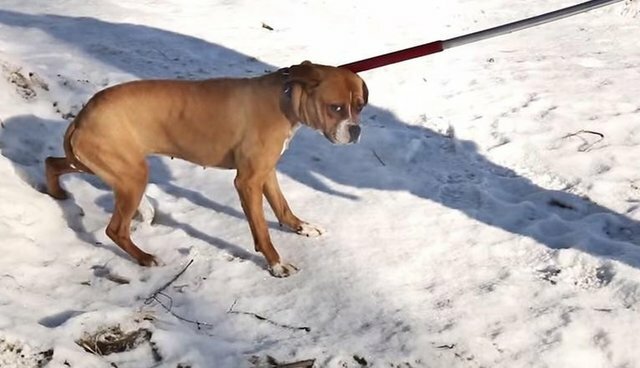 It took days to bring Sweet Potato in from the cold - the little brown dog was homeless and hiding out in a snow-covered pile of trash when the Michigan Humane Society got a call about her back in March. Chris Ouwerkerk, a rescue driver for Michigan Humane, went there day after day to try to bring her to safety, but each time she got scared and ran off before he could calm her down. Until one frigid day, when he found Sweet Potato curled up in a cardboard box, struggling to keep warm, and she didn't immediately leave when she saw him. "The wind's been blowing and it's been below zero," Ouwerkerk explained. 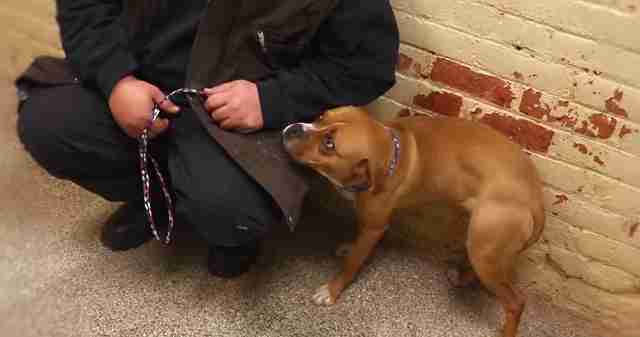 "She was very scared, she wasn't running at this point, I think she had just been wore out by the cold." He managed to get her in the rescue van and take her to the Humane Society for care. The car ride seemed to warm Sweet Potato a little bit, but once they arrived at the shelter, Sweet Potato was too frightened to walk in on a leash. She crouched low to the ground and let Ouwerkerk scoop her up and carry her inside. Ouwerkerk stayed with Sweet Potato once they were inside - and it's clear from her gaze that despite her fear, Sweet Potato realized that this human wouldn't hurt her. "She was still scared but she was very, very sweet," Ouwerkerk said. "Staying real close." After some medical attention, Sweet Potato was ready to get settled in. 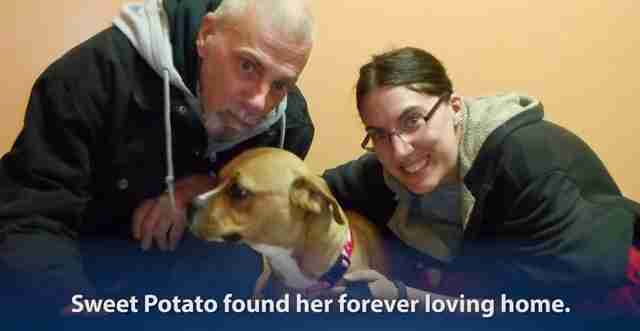 But she didn't stay long at the shelter - only shortly after her rescue, Sweet Potato found a forever home. Which means no more cold winters outside for this little gal. Rescues like Sweet Potato's happen every day, at shelters and rescues all around the country. And anyone who's ever adopted a rescue animal knows the joy of giving a dog like Sweet Potato a second chance in a safe, loving home. To find out what you can do to help rescues like Sweet Potato, contact your local Humane Society today.